Discussion in 'Religion' started by Danr, Mar 20, 2007.
do you sleep or do you stay up all night sitting in the dark with a tin foil hat on with visions of boogymen coming in and dragging you of to a gulag? Just wondering...are you in america? How has america harmed you? I have been all around the world and I sometimes think people in America just dont know how good they have it because they just dont have real experience of how bad a government can truly be...when I come home from Nigeria I am so happy to be back and so much more happy that I live in America. My only defense for America and its freedom is that a person like you can live here and enjoy all the benefits this country provides even while you crap all over it...now thats freedom...try and say what you say in China, middle east, Africa, etc...just make sure to say your last goodbyes, you'll never be seen again. You seem almost tyrannical is your agenda, completely contemptuous of any other point of view...maybe freedoms arent your thing, maybe in reality you would rather force your ideal on everyone for their own good...You know we will be having elections again soon, maybe your wisdom will shine through and people will vote your way...maybe not...Americans are blind right? am I right? Pray tell...instead of constantly whining about the ills, how about you tell me how you would change our government, legal system, society...lets say, god forbid, you were elected president. What would be your modus operandi...try to do it without pointing fingers...just how would you make america better? Drusus, as of late you have attacked the messenger rather than the message in just about every post here. You must realize that this approach is the fast track to irrelevancy in this forum. Danr may sound a monotone message but all you have to do to counter it is to cite examples that contradict his points. If that's not possible, you could always consider what he is saying as a last resort. I'm not trying to attack you personally but I have noticed that your posts have changed over that past few months. I used to agree with you on a lot of issues and now I rarely agaree with you. I'm all for people having different opinions than my own and I will always argue vigorously for what I believe in until proven wrong but I hope that I don't resort to attacking the messenger as a matter of course. If I find that I'm actually thinking about conversations that I have had in this forum when I am not online, I know I need a break. What's your bellwether? sorry moen, I doubt we ever agreed on much save that Midas hates Islam, I have noticed that the same bias he shows is shown by others such as darn but simply replaces Islam with Bush and Danr is foaming at the mouth as bad as Midas is. You must be joking when asking for me to actually address some points on a little graphic posted by a person who has consistently shown he is in no way open to level headed debate (and has not balked at calling anyone who tries an idiot). It would be like debating Midas about Islam...there is no middle ground, you should know this about Danr by now, his sig for some time was Bush photo shopped as the devil...When comparisons to Hitler and the devil are in play, I know I am not dealing with a rational person...again..one must take into account the source. Would you bother debating a crazy person in the street shouting to anyone who will listen how the government is evil? if ever there was a person not worth spending time debating his random outbursts, it would be Midas and Danr....Maybe you dont see this because you align much closer to his rabid view point. A little graphic gleaned off a left wing website is not an invite to debate nor does Danr want one, he is simply doing the equivalent of shouting into a crowd. 2. America comparatively has high regard for human rights, not all of us but again...that will always be the case. 3. Its wrong to identify enemies? 7. National Security...how is concern for national security wrong again? 9. Corruption is rampant and always has been, business is the back bone of our society...without it we would be in the stone ages...but certainly they lobby and receive favors...vote out those who do this. 10. Labor has more power than ever before in our country. It is a delicate balance. 11. There has always been people who disdain intellectuals and the arts...some times so called 'intellectuals' can be a bitter pill to swallow but not now more than any time else....In a free nation people can dislike what they choose. I do not dislike intellectuals; I dislike people who think they know what’s best for everyone else….its always good for intellectual to remember they are not better than anyone else. Education does not make you worth more than your fellow humans who might not have had the benefit of it for one reason or another. They can be just as damaging as non-intellectuals…so called intellectual as responsible for the Soviet Union…bang up job. 13. Cronyism and corruption is a mainstay. not any worse now than the previous administration. 14. The only problem I see with our elections is that they are not popular...other than that I have seen no evidence of fraudulent election any more than I saw evidence of it…but out partisan system does breed dishonesty and cronyism…this has always been the case. In this case, Danr is overstating something that is actually occurring but to a lesser degree than he would espouse. 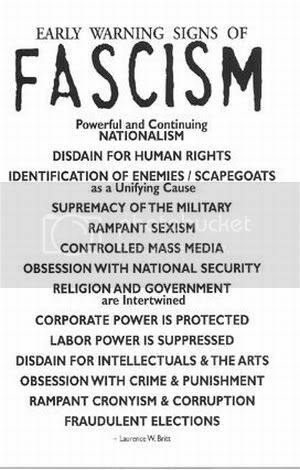 On a graduated scale, we have been moving closer to a fascist society recently...Are we there yet? No, but we are trending that way. I've read enough on fascism, colonialism, empires and such, to recognize the similarities we have in common with such societies but it isn't irreversible. We haven't fallen over the edge yet as some would have you believe (Danr and Midas types), but there does need to be some self-examination to avoid a colpase. I think that is what I'll take away from this thread, not the overt extremism of the poster. Try to read the post before replying. I am calling facism the enemy of America, I never claimed to be injured by America. Why do you think they say "all enemies foriegn AND domestic", why do we have a second amendment? Your trust of government is absolutely frightening (you are similar to the 30% of Russians who still think Stalin was a great guy). The trust some people put into the government IS really scary. You know, when I read posts that AMERICA and our system of government is the problem and the enemy of the civilized world, I just shake my head. "You should enter into debate or respond only if it is extremely necessary... Your concern should [only] be introducing topics which... will cause [them to feel] frustration and anger towards their government..., which will... render them hostile to Bush... and his Republican Party and make them feel they must vote ton bring the troops back from Iraq as soon as possible." "Do not... discuss issues pertaining to Arabs or Muslims at all, whether negatively or positively... because this could be a trap for you... In addition, do not ask people to circulate the material [you have posted] in other forums... as these types of requests will expose you..."
Now I am sure that Coin Talk may not rank in the top web forums, but as I read many posts about how AMERICA is the problem unlike the "true" muslims that wish sharia law for the entire world and are willing to die for it, it just disgusts me. There has to be an explanation for this and I just found this news item today...it does make sense when you think about it. Thanks a lot Midas you infidel pig #@*^%$#*@! Now you've blown my cover. May Allah spit on your filthy American president. America isn't the problem but some of our current leaders and our long running inept foreign policy certainly have contributed to the problems we are facing today. We are doing what we can to deal wth those people that want to do us harm but we can also do much more here at home to correct our own mistakes. There are two fronts in this war and they need to be fought simultaneously. "By virtue of the authority vested in me by Section 5 (b) of the Act of October 6, 1917, as amended by Section 2 of the Act of March 9, 1933 …, in which Congress declared that a serious emergency exists, I as President, do declare that the national emergency still exists; that the continued private hoarding of gold and silver by subjects of the United States poses a grave threat to the peace, equal justice, and well-being of the United States; and that appropriate measures must be taken immediately to protect the interests of our people." numismatist Tom DeLorey recounts a story told to him by Abe Kosoff. "Abe Kosoff once told me how he had arranged, on behalf of a few wealthy clients, to have bags of U.S. $20s shipped to a European bank PRIOR to the Gold Surrender Act, in anticipation of it and in the expectation that the price of gold would be raised. It was. He was then visited by a U.S. Treasury agent AFTER the Gold Surrender Act who told him that they had been examining bank records to see who had been withdrawing gold coins in the six months prior to the Act, and that according to the records he had withdrawn x number of bags of $20s. He was given a fixed amount of time to return the coins to the Treasury, or face prosecution. He got them back and returned them." In addition, another individual (Frederick Barber Campbell) lost a large holding of gold bullion stored in the Chase Manhattan Bank in 1933. It is true that in 1963, federal agents seized gold coins from the Witte Museum in San Antonio. The law that permitted the seizure of gold from U.S. citizens is still in effect to this day. In fact, the Executive Order remained in effect from 1933 until 1975 making it illegal to own and hold gold bullion. Shortly after the order went into effect in 1933 all gold was seized and Americans were given new "paper dollars." The value of gold was then raised which devalued all paper dollars. This immediately reduced purchasing power of the "new paper dollars" and overnight robbed hard working Americans of millions of dollars. I'm not sure what effectively taking us off of the gold standard during the Great Depression at a time when our country was bleeding gold has to do with what is happening today, but, past abuses, and there have been many, don't justify the current state of affairs by any stretch of the imagination or this stretch of logic. Right or wrong, people back then considered it their patriot duty to turn in their gold and lined up for blocks to do so. They not only turned in coinage, but jewelry, family treasures, and anything else to help the country get out of the Depression. They gave to do their part for the country as willingly as any soldier ever has on a battlefield. Did some private citizens and large institutions hide gold to reap huge profits? Yes. It was the little people that filled the banks with gold again bit by bit until this country was back on it's feet. If it was government oppression as you say, it was for a good reason, not some trumped up war by some idiot from Texas. I'll take FDR over GDB(George Dumbf*@# Bush) anytime. I am not saying it justifies anything being done today or lessens it...I honestly dont believe there is any 'rights crisis'...I was showing an example of a REAL fascist government. So what you are saying is it was okay for the government to raid you safety deposit box, your home, your person effects and take your personal belongings? It was okay for them to lock up your finances, not allow you access to your own belongings...then for them to give you a fraction of its worth in paper money? You think that is NOT worse than what the government is doing now? Interesting...truly interesting. I am not say it justifies anything being done today or lessens it...I honestly dont believe there is any 'rights crisis'...I was showing an example of a REAL fascist government. Now you are the one using hyberbole. What "storm troopers"? People voluntarily lined up to help this country in a time of national crisis. Neither you nor I was alive at the time which should really put a damper on your indignation. If the only example you could manufacture was over 65 years ago, I'm not too impressed. The government takes your "gold" everyday in taxes as well as your children's gold with the current deficit. It's just that it isn't actually gold but paper wealth...what's the difference? You can own gold today. You can hide it if the government decides to ask for it back. You probably will. I find fights over money more of an arguement for the Right. I just am not that attached to something so meaningless and superficial. You're making the same arguement Midas has made in the past. That should tell you something. He couldn't see how his civil liberties had been affected either. Well, white males will be the last to feel it if it does happen. I think this country is too smart to go down that road but if we start to some of the first to know it may be gays, immigrants legal or not, artists, intellectuals and eventually interracial couples and so on. I don't know why this is so inconceivable to you but vigilance might be your best bet. Blind allegiance isn't going to work out so well I'm guessing. Just because we have lived in a free society all of our lives doesn't mean it has to stay that way. I plan to look out for my freedom and yours. You can look out for your gold. I am not using hyperbole, they forced people to hand over their gold and used government agents to confiscate it...jailing people and taking the power to confiscate personal holdings...that s a fact. This is fascist. I find it hard to take a person serious waving his fists about heavy handed government (far less than such an example) who cannot see the wrong in a government confiscating your personal belongings...people lined up? Hardly, they, like you, thought the country was in a time of crisis and knew it was either give it up or it would be taken and they would be criminals...sound familair? A time of crisis? Situation called for the government to take our rights away? doesnt sound familiar? This is just one example of many where the government has taken it upon themselves to take our rights away...I wont bother listing the many others...I was trying to put things in perspective...yet NOW its an intolerable? because the government, in what they consider and emergency, has enacted more powers to enable them to better deal with that emergency? Well maybe there are always people in all times that dont agree with what the government calls 'emergency'. People are constantly pointing out countries in the middle east, or communist regimes, and saying how much better America is than those places. I don't think anyone here who criticizes our government (government, not the whole country) would rather live in North Korea or Iran than the U.S.A.
Why do I never hear the people here with such blind faith in the government say things like "Go to Switzerland, and then try to tell me how bad America is." hmmmm. Here, I will...go to Norway where the government taxes 2/3rds of your pay check and is about as big brother as you can get, everything is heavily regulated...come back and tell me how bad america is. Or worse yet, go to France Both great places but I would NOT want to live there.